Has only had light use so in excellent condition. Box is also is great condition so would be a perfect gift. THINNEST AND LIGHTEST: At less than 2 lbs, it's the world's thinnest and lightest 2-in-1 android tablet Based on Lenovo’s internal analysis as of 8/18/16 of 10.1” or greater 2-in-1 computers (sold with keyboard). IF YOU HAVE PROBLEMS WITH YOUR DEVICE At CIT Electronics, we are proud of the service and quality of the products we provide. SPECIFICS OF DEVICE CONDITION. (used - normal wear). Works excellent. I will include a free Lenovo Yogabook Sleeve. It makes a great gift! Use the included Book Pad clipboard to magnetize your papers and easily keep them in place. Do it while looking at your screen and seeing your notes being digitized before your eyes, or using the Lenovo NoteSaver application to use your Yoga Book as a smart paper pad—folded open for the most natural way to take notes. 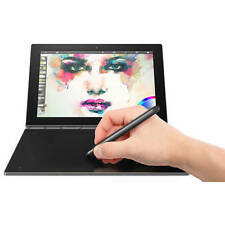 NEW Lenovo Yoga Book 10.1" 2 in 1 Intel X5 2.4GHz 4GB 64GB Windows 10. Condition is excellent Shipped with USPS Priority Mail. Notebook, Tablet, Notepad 3in1. - 4GB RAM, 128GB SSD. Storage: SSD 128GB. Lenovo Yoga Book Pro. Model Number: YOGA Book Pro. - Windows 10 Pro 64Bit. - Upto 13hours Battery Life. - Any conductor that can be held in your hand can be used as a pen. Scratches on the back (as shown in picture). Other parts are in great condition. All accessories (Battery, AC adapter, Pen, Paper, and Power Cord) included. We will try our best to make it as easy as possible. Sold because I do not get along with Android. If it is not in the picture it is not included in the sale- for example power cables, batteries, adapters, probes, manuals. Storage Device: 64GB SSD. as picture show, what you see, what you will get it. We always correct any problems! T he laptoplist for used in excellent condition. Condition is preowned but flawless. Here’s what Lenovo managed to cram inside one of the year’s thinnest tablets. The Yoga Book’s versatility is unmatched in both the laptop and tablet worlds combined – in that it actually collides the two. Make notes or sketches using a stylus with real ink. Type on the Halo keyboard that appears when you need it – and vanishes when you don’t. Yoga Book with Windows - The Ultimate On-The-Go Windows Creativity Tablet. Make notes or sketches using a stylus with real ink. Type on the Halo keyboard that appears when you need it - and vanishes when you don't. Get things done on our custom version of Android that lets you be productive like never before.